Bit of an update... I am still waiting for the other plugs to close off a demijohn with a fermentation lock in it. The shop only sent me one and has been dragging its feet over sending me the rest. I'd been waiting for that to set up the next two batches. I got two 5 liter and 2 10 liter demi's, which brings me to a very nice capacity - I will probably only set up one 10l at a time and keep the other one for racking into. He had two very beautiful larger demi's - he thought 25 liter, but he thought the 10s were 15, so they were probably 15 or 20s. I was tempted but there's just no way I can physically handle that sort of weight. Also got a bunch of old waterlocks (trying to get them clean now, which is a pain!) and corks and a corker. And we chatted a while. He gave me a good deal on the stuff and I offered that if he's ever near my hometown, he drop by and I'll give him a bottle. 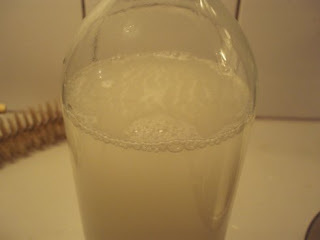 Have made a yeast starter ("Brain in a bottle") to start off a new batch tomorrow. This'll be another normal mead, because I still have the very nice Springbalsemien honey. I also bought some reasonable supermarket honey that wouldn't be dramatic if I ruined it, so with that I think I'll try one with fruit. Blueberries? Strawberries? There are just so many options. Maybe I'll do one with fresh mint leaves, that sounds like it could be interesting.